Cutting down or trimming branches that are in difficult to reach heights requires a high-quality, versatile, and sturdy tool. Selecting the right manual pole saw or pruner for this task is, however, a bit of hard nut to crack. There are hundreds of models on the market, each with its unique features, selling points, and specifications. So what do you need to do in order to get the best manual pole saw for your needs? We made it our duty to help you and dozens of other buyers like you to find the ideal manual pole pruner that will bring value for the money. In this review and buyer’s guide, you will get a comprehensive review of manual pole saw and a buying guide to help you know what to look for and what to avoid. Simplify high and tough cuts with Fiskars Extendable Pole Saw and Pruner, which extends up to 12 ft. and features 2 different cutting choices. Its unique double locking mechanism makes sure that the pole remains extended for efficient control. This lightweight and easy to handle pole makes cutting lofty limbs a piece of cake. The pole enables you to trim branches of one inch thick with its durable and sharp pruner that also feature a low-friction cover for smooth cuts, enhanced rust resistance, and reduced gumming. This is an extendable pole that is made of a lightweight and durable aluminum material. It is oval shaped to offer the required support in the direction of the saw’s blade. The total weight of this powerful landing pole saw is 6.9 lbs. and the best thing; you can remove the saw-head without using any tool. Another great feature of this tool is that it comes with a warranty that is provided by the producers in case of issues in product materials and workmanship. The pole is made in Japan. Oval shape gives it strength. Very safe due to the positive locking system. This is the ideal tool for trimming large and small branches alike. Its two-in-one tree trimming mechanism comes with a power-lever tech that offers 2 times more pruning energy, plus a superb woodzig saw. Its oval shape is unique and minimizes flex when you extend it, and even allows you to control the direction of the cut better. The pole saw and pruner also comes with a breakthrough blend of a flip lock and an internal spring button lock that ensures your pole extension remains extended. 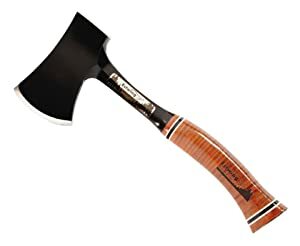 Perfect for trimming small and large trees. Easy to control the direction of cut. 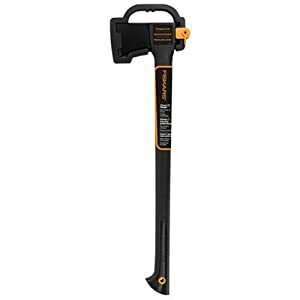 With Finether Telescopic Pole Saw, no branch will be out of reach because it extends up to 13.12 feet to help you cut away leaves, twigs, and branches safely. You don’t need a ladder to reach those high hedges and thorny bushes. The other notable feature of this tool is the 2 cutting options of the scissor-action that trims branches of about ten mm in diameter and the detachable saw blade for cutting thicker branches. The bypass and cut pruner enable you to hold the cut in the direction you want, making your harvesting or pruning easy. Safe to use due to safety lock feature. Jameson’s package comes with tools that you require to trim all your trees. Pole ferrules facilitate any combination of poles with this tool to attain different lengths, according to your job. This product comes with a tri-cut edge that offers you a cleaner and more efficient cut. The best thing, the saw head is permanently installed on 6 feet pole. The package also includes a 6 feet extension pole, a 6 feet extension pole with a saw head, and 6 feet base pole. Low profile head for maneuvering dense foliage. External leaf spring locking system. Might bend under intensive cutting. With this unit, you will be able to reach and trim branches that only a trimming company can do. This pole also functions as an extension pole – you can use it to paint your house, change light bulbs, and wash windows. This product is similar to commercial units but has an exception since it has a hook. The pole comes with a fiberglass handle, 2 aluminum extension tubes as well as a quick, durable locking system. This is a great product that comes with a metal case that ensures it lasts long. 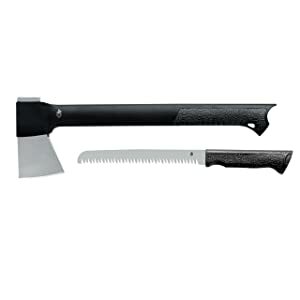 It cuts via tree limbs with ease and is perfect for limb-lopping as well as general cleanup of your yard. With this pole, you will reach high branches with ease. The best thing, this product is pretty affordable and last for years. Suitable for reaching high branches. 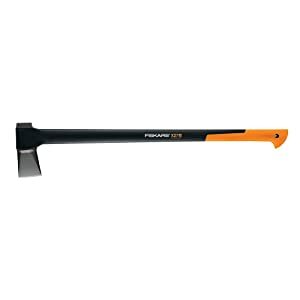 Our top pick for the best manual model is the Fiskars Extendable Pole Saw and Pruner. The pole extends up to 12 ft. and features 2 different cutting choices. Its unique double locking mechanism makes sure that the pole remains extended for efficient control. This lightweight and easy to handle pole makes cutting lofty limbs a piece of cake. You might be wondering why you should buy a manual pole saw instead of a power-driven one. Here are some clear reasons why you should choose this model as opposed to any other model for your garden needs. 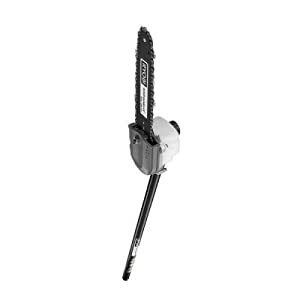 Very Lightweight – Manual pole pruners are very light when it comes to weight as they only have a saw and a stick. Very affordable – Manual pole saws are the most affordable models on the shelves. This is because they do not require any extra or complicated tools such as batteries or cords or gas cylinders as electric and gas pole saws require. Additionally, they do not have a chainsaw but just a simple traditional saw that reduces the operation cost. The Length of Pole – Extension or length of a manual pole saw is a key feature here. They are the tallest and hence able to reach branches that are in high points. Some of these pole pruners can reach up to 20 ft.
Easy Maintenance – You do not need to cough out any future cash or effort to maintain these saws as they do not have chainsaw or batteries or gas cylinders as found in gar or electronic powered models. You only need to sharpen the blade and you will be ready to go. Product Warranty – You might get a long-term warranty which proves that your pole pruner is quality if you buy from a reputable brand. Health Benefits – A manual pole pruner is a superb choice for a person who does not have time to do regular workouts. 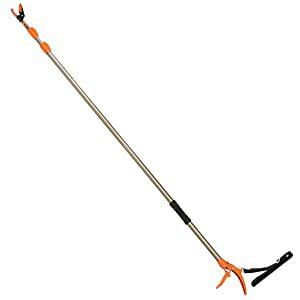 Purchasing a manual pole pruner is the best way to keep your overhead yard tidy and neat. It also helps to keep the branches away from your fences, roof, and walls. But getting them isn’t easy; there are factors that you should consider before you settle for a specific brand. There are a variety of ways to prolong a pole saw. Some brands shift outwards, others come with segments that need to be joined. These mechanisms shouldn’t really worry you, as long as the pole is of high-quality. What matters is how far or long the pole saw can extend. Take a walk through your yard and think about your present and future pruning or cutting needs. The majority of manual pole saw can be shortened to about 4 ft. or even less, but of importance is to ensure that you get a model that can meet your extension needs. 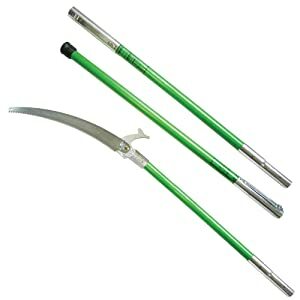 When you are looking for a manual pole pruner, limit your search to models made from fiberglass or aluminum. There might be other high-quality materials that you can consider as well. It is critical that the material – no matter which one – is sturdy and light. The pole saw is your only way of controlling and navigating the blade. If you have a wobbly pole pruner, you will only make hundreds of widespread cuts on the branch you intend to trim without actually trimming it. Again, if the pool saw is heavy, you are likely to get tired faster and lose your efficiency. The best pole pruner should be constructed of high-quality material. Or do you want your pole saw to bend, break, or snap while you are in the middle of an important project? In addition, ensure that the connection between the pole and the blade and the connections between segments are sturdy and durable. The pole pruner blade should be constructed from a high-quality material. One of the most common metals for manual pole saw blades are high-carbon SK5 steel. In case you come across a blade that is made from another material, do a thorough research to find out about its rust resistance ability and durability. Most blades feature a coat that keeps the teeth open and clean for easy cutting. This coat also repels plant materials. They might also come with a hook at the end that you may use to pull plant ropes or branches out of the tree. Some blades might also come with a scabbard at the rare to make sure that the blade remains on the branch. This prevents lots of frustration. 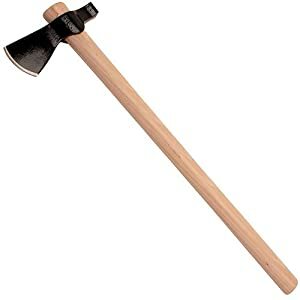 The other critical thing that you should watch out for is the ability of the blade cut through thick branches. Go through the blade features and specifications to find out what tools or features are fitted to the blade. Some blades come with a quick-release button while others don’t. If you are like me, watch out for these features. Also, keep your personal needs as well as requirements at the back of your mind when reviewing the blade. Never assume that any blade will be sufficient. Quality should be the number one factor that you should consider when buying a manual pole pruner. A pole that is pretty short, a blade that needs to be removed using tools, or a grip that isn’t comfortable will only add frustrations to your cutting or trimming task. Without quality, you are destined for a rough time. Do not compromise on quality. In case you don’t have sufficient funds, go for a less versatile model or the one that uses an older technology. The easiest way to know how a tool will work is to go through online unbiased reviews. Many individuals who have used a certain pole saw for a while are often willing to share their experience and provide you with an idea of what you should expect when it comes to performance and quality. You should ensure that you maintain your manual pole pruner in order to keep it in good working condition and prolong its useful life. Some models come with maintenance schedules; however, the majority of these tools require almost a similar upkeep process which we have discussed here. Ensure that all bolts, nuts, and screws are tight. Ensure that the trigger and the lock operate normally before you start to use your saw. Inspect the chain and ensure that it’s free of breaks. Perform a thorough cleaning on the outer part of your tool (a damp rag will be fine). Clean under the protective cover. Return your tool to the storage bag. Inspect all connections and cables. 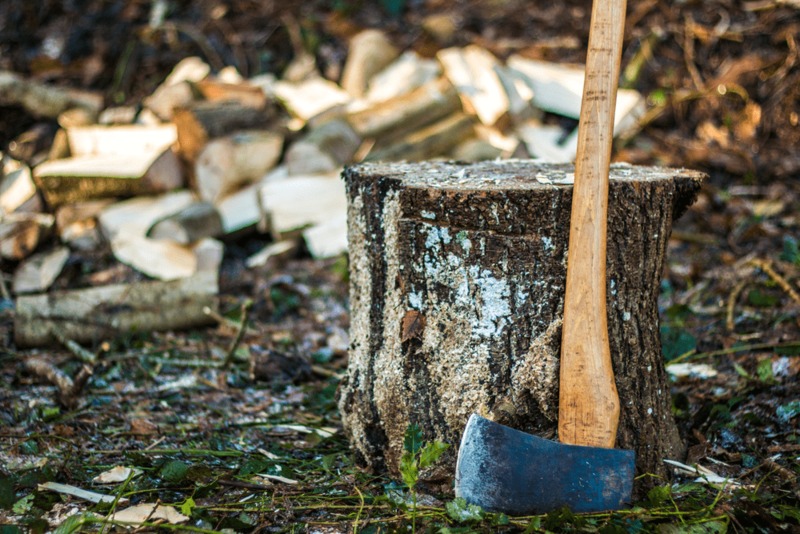 Once you start to think about cutting or trimming branches in areas you cannot reach while on the ground, you are getting into a dangerous project. When experts drop pieces of woods, they usually use ropes in pulley systems to safely slow the descent to the surface. When you trim branches with a manual pole saw, you cannot use a pulley system; you cannot control the fall of the branch. Heavy or high branches can hurt, damage, or even kill when they descend. Manual pole pruners should be used to cut branches that are a few feet above the ground. The thicker the branch, the more deadly it is, and the more tiring and slower it will be to trim. You should never attempt to cut branches overhead until you understand all the techniques of reducing weight before engaging in the cut by making the jump and preliminary cut with your manual pole saw. 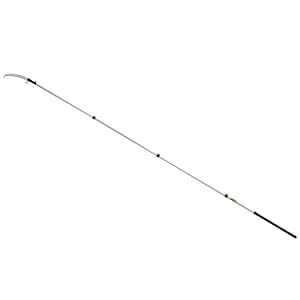 Manual pole pruners, especially the one that extends above 8 ft., are tiring to work with and often heavy. Never work near power lines or cut branches above power lines. It is fine not to do any cutting that you cannot reach while standing on the ground. If you are a first-time user of a pole saw, ensure that you read the manual, instructions, and cautions that come in the package. Q: My manual pole saw won’t cut straight. It pulls sideways while trimming branches. What could be the problem and how can I resolve it? A: This often occurs when the chain becomes damaged or dull. Your owner’s manual has a comprehensive topic on how to sharpen your saw properly. If the saw is extremely dull, you might need to consult a professional service provider to sharpen it for you or even replace it. I need a manual pole saw. Where can I get one at an affordable price? A: You can find these tools at your local store or online. They often cost the same but there are both pros and cons of buying from either of the two places. With that said, we would recommend you to get your pole saw from your local store (it is easier to return in case of anything). It has been an eye-opening experience. As you have seen, the best manual pole saw is not the most expensive one. In fact, these products are very affordable when you compare them to gas or electricity driven-ones. If you haven’t still found the best pole pruner for your need, we recommend you to go through this article again. We are sure that you will get a model that will give you value for your money. Do you want to start your home compost fertilizer but do not know where to start? 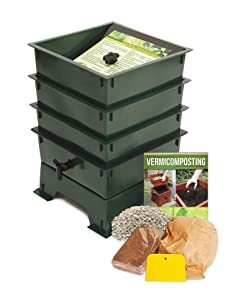 A worm composter or worm farm or worm bin uses worms to turn kitchen waste, grass clippings, and leaves into fine compost material for your yard. But what is the best worm composter? 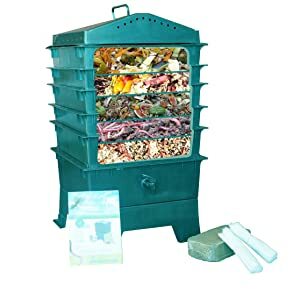 There are hundreds of worm bins reviews online but knowing what features to watch out for and find the ideal worm composter for your garden or home can be a daunting task. We have done our research and put together a buying guide and reviewed some of the best worm farms to help you get the best. This is the process of using worms to turn compostable materials into compost fertilizer instead of throwing them away and hoping that Mother Nature will do the job. The worms feed on your food leftovers and other remains and as it passes via their bodies, they produce “casting” which is full of nutrient and make fertile soil. This Nature’s Footprint worm factory is very easy to setup and use, needing just fifteen minutes of your precious time every week to make rich compost. It features lots of freebies that accompany it when you buy it, making sure that you receive the materials and instructions you require to prepare high-quality compost at home. One great feature of this unit is that you can expand it due to its multi-tray design. It comes with four stacking trays and it was made to hold up to eight trays. Although perfect for small households due to its small capacity, you can easily adjust its capacity by adding more trays to hold compost for a bigger household. The best thing, you don’t need a professional to assemble it or add the trays. Another feature of this worm composter is that it comes with a 10 years warranty. This means that you can prepare composts 365 days without freaking about your unit getting worn out. We mentioned freebies; while every unit comes with quick tips lid (you can also use them as stand or guide of managing worms), mineral rock dust for nutrients, worm ladders, an accessory kit, instruction-manual with DVD guides, worm bedding, and spigots for worm-tea. Can make eight trays of compost at a go. Offers a pest-less and odorless compositing experience. One of the best features of this product is that it is odorless. What that means is that it has a quite small footprint, and you can use it in your house without worrying about anything. It is also very easy to assemble and use and requires little maintenance. You will also be glad to hear that it is highly durable and comes with a 3 years warranty. Although this unit is more expensive than creating a worm compost bin by yourself, it is more affordable when you compare it with other brands on the market today. One major feature you will love about this unit is that VermiHut is dedicated to sustainability themselves as the bin is made of 100 percent recycled plastic. Another great feature of this product is that it comes with a small footprint and a compact base. The other notable inclusions that you will love of this product are five stacking trays, a pedestal base, a liquid collection tray, and a lid. You will also be excited when you learn that it’s very easy to collect the warm tea due to the spigot that accompanies the unit. Fully expandable to seven trays. Takes time to assemble for first time users. This bin uses worms to recycle your kitchen remains, cardboard, and paper waters into nutrient-full compost, and is better than a customary backyard compost site, when it comes to efficiency. This product provides 10 times the nutrients of your traditional compost to ensure that nothing is lost from your food scraps. This product is very easy to set and use, it will only take you about fifteen minutes per week to get everything in order. To get rolling, simply add worms and your waste to the last tray (the bottom one). The warms will do the magic. Once the last tray is filled, add another and continue with this process until all trays have been added. The best thing, you can use this unit year-round outside or inside, and get rich compost at least once per month for use in your garden. One thing that you will like about this product is the bonus that it comes with it including “What Can Red Wigglers Eat?” an infographic magnet that sticks to the refrigerator for easier reference. It is a superb way to remember that your worms require veggies but eggs shouldn’t go inside your worm compost. Most worm composts are heavy and wider than their height, so they often take up lots of space. This unit features a unique design that forms a small footprint. Its bottom is narrower than the top. This creates a constant flow that is different from units that use trays. This tapered design casts the worm down toward the harvest area but keeps your worm at the top, where they break down your remains. The pressure formed in this design leads to a natural plug that leaves the scraps and soil in the top part. The best thing, the casting area holds about ¾-gallon of castings and doesn’t contain any worm. 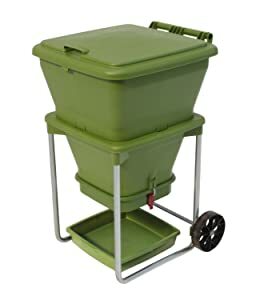 You will be excited to learn that as your worms create the liquid, that watery produce drains into a collecting tray at the bottom of the composter. The best feature, the tray has an easy-to-pour spout that enables you to disperse the compost when you need it. If the weather gets too hot or too cold outside, you can easily relocate your bin to another location. The top of the bin has a secure handle that makes it easier to move around. Another thing that you will love about this bin is that its legs are zinc-plated and weather resistant. Easy to harvest the fertilizer. Smaller than other worm bins. Not recommended for extreme weather. Although worm factory can be time-consuming it’s a project that often produces fruitful labors. It is the best way to turn kitchen remains into compost. What is better than using the DS3GT worm factory from Nature’s footprint due to its “green color” and the fact that it’s made of recycled plastic. 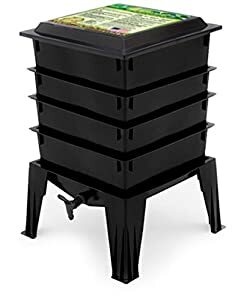 This worm factory uses stackable trays where the worms work their magic from the lowest to the uppermost tray, making your food waste turn into fertilizer. This unit also produces leachate, a form of liquid fertilizer that you can drain via the spigot. 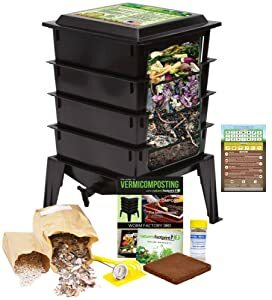 The best part, this compost unit comes with an instruction DVD as well as a manual to guide you through in order to get the best out of your unit. For new users, initial setup and initial compost cycle might take time to get used to, but it’s worth your time and effort. This product saves room and creates a garden that produces regular high-quality crops. Produces 2 types of compost. The Worm Factory 360 WF360B Worm Composter is a great bin that you should try out, especially if you are a beginner. It offers some great features such as easy setup, expandability, durability, and other freebies that accompany it. Price – This will depend on your wallet and budget. In general, for a larger size or higher quality worm bin, you should expect to pay more. Design – Some worm units are not only easier to use but also set up. The majority of these worm bins come in trays enabling you to easily expand them by adding additional trays. There are also some flow-through warm farms which have started to gain ground. Appearance – Nobody wants to own an ugly thing. Getting an attractive worm composter is important. Setup – You shouldn’t waste a lot of time setting up your worm bin. Drainage – A good warm farm should have a drainage system. Insufficient removal of excess juice can result in different forms of anaerobic activities. The worms breathe clean air via their skin and they will die if their bedding is excessively moist. Shape and size – The shape of your worm bin is also an important thing that you should consider. This will affect where you want to store it. Again, you don’t require a huge worm composter is you only leave a small amount of food remains. Different worm species do well in different environments. Some will do well in a warm place while others will do well in a cold place. Although it is common to use different species of worms to enhance the resiliency and overall strength of your worm bin, ensure that you get a worm farm that is suited for your specific warm species and climate. They don’t mind handling and disruption. They live in the top part of the material. African Nightcrawers and Blue worms are perfect for warmer climates while European Nightcrawers are ideal for cooler areas. Nightcrawers tend to stay in the soil and they only surface during the night. The perfect starting amount is a thousand worms. You might require more for bigger worm composters when starting out. Under the right conditions, the worms will reproduce rapidly. As an example, Red worms can double their population in every 2 to 3 months. Worms consume about ½ of their body weight daily. One thousand worms would weigh around 500 grams or 1 pound. So if you intend to throw away about 250 grams of food remains daily, then you require about one thousand worms. Shredded old newspapers make the ideal bedding material. Compost worms stay on top or near the soil surface. Worm farm bedding creates a home for the worms to live in. Beddings also help to capture moisture and enhance airflow in your worm farm. Beddings also make a long-term source of food for the worms. Worm composter beddings often consist of a mixture of carbon material like cut up pieces of cardboard, old newspapers, and egg cartons. These materials should be at least 80% moisture. Therefore, you need to get a worm farm that can facilitate smooth flow of air in order to get the required moisture. There are some worm units that come packed with coconut coir beddings to get you started straight away. Worms are highly tolerant to different environment settings. But there is a little bit of effort and science required in order to maintain your worm composter properly. This includes checking the moisture level and regulating the unit temperature. Ensure that you feed your worms the right type of food. Also, ensure that you don’t overfeed them because you might end up experiencing some serious worm composter problems. Keep in mind that worms only feed ½ of their body weight per day. Avoid garlic, onion, dairy, meat, citrus peel, craps, and raw potato skins. Always add carbon whenever possible such as cardboard and newspaper cuttings. The carbon to nitrogen ratio in your worm farm should be 1:1 or even higher. Always add more paper when in doubt. Sometimes the pH level in your worm composter might get low. Adding a handful of agriculture line or crushed eggshells every 7 days will work wonders to keep the pH level in the right level. Although some worms can survive in temperatures of between 59-86 degrees F or 15-30 degrees Celsius, you should still regulate the temperature inside your worm bin. The worms might suffer or die in extremely cold or hot temperatures. Every 2-3 days, check the moisture in your worm farm. The damp sponge test is highly recommended. It involves squeezing the beddings in your hand to see if water will drip out. 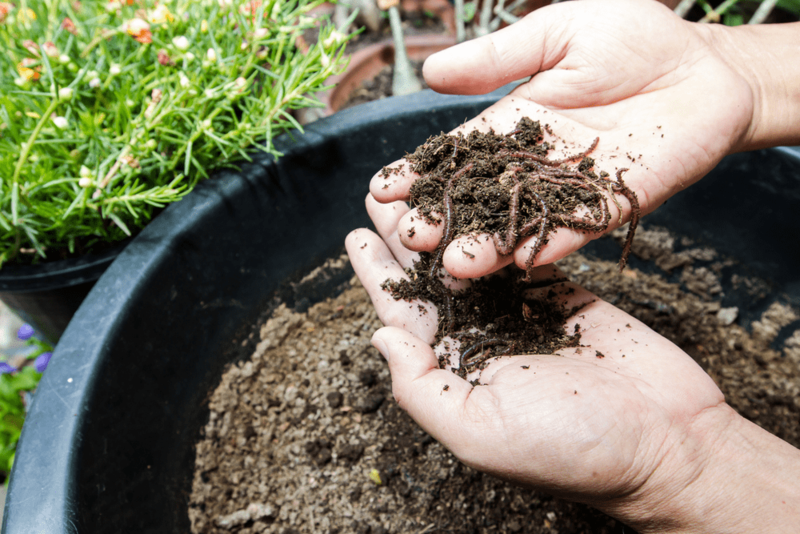 Worms are highly sensitive to light, so keep your worm composter in a dark area. Watch out for any harmful pest that might harm the worms. The majority of pests such as fruit flies and potworms are harmless but keep an eye on them. Remember to drain the excess liquid every 2-3 days (worm farm leachate or worm tea). And every month or after few months, change over trays to harvest the castings – the richest fertilizer. Q: How should I get rid of fruit flies around and inside my worm composter? A: You can use a fruit fly trap to capture these pests. They don’t contain any chemical that might hurt your worms. Alternatively, avoid this problem by burying any excess waste instead of overloading your worm bin. Q: My worm farm produces strong, unpleasant smell. What should I do? A: The odor might be coming from the rotting food remains because you are overfeeding your worms and the remains are just sitting in your worm bin. Stop adding food remains until the worms have consumed what they already have. Also, avoid some type of foods such as meat and onion. Q: There are worms crawling out of the worm bin and onto the lid and sides of the bin. What is the solution? A: The beddings might be highly acidic forcing the worms to leave. They often become acidic when you add excess acidic food remains like orange peels. Reduce the amount of acidic food you are adding into your worm farm. Worm bins vary in design, size, shape, color, and price. Choosing the best worm composter depends on your home needs. Additionally, ensure that your worms have all the things they require to produce high-quality fertilizer for your yard. You aren’t done mowing your lawn until you have trimmed all the little spots and the edges as well. There are areas that you will require the best commercial weed eater to trim, such as around your mailbox and along flower beds. If you own a small garden, a regular weed eater might do the job effectively. However, if you trim multiple gardens or have big lawns, you will require a commercial weed eater. Therefore, whether you own a large yard or you are a commercial landscaper, any one of these top-rated commercial weed eaters will make a significant difference to how much time and effort your mowing will take. But first….let us look at a complete buying guide for commercial weed eaters. The LST136W features a 13 inches cutting path and long-lasting battery to last you for 25 minutes, providing sufficient power to trim the toughest weeds and clear a reasonable area to reduce the effort and time you spend mowing your yard. The product weighs only 7.8 pounds when the battery is installed. This is an awesome weight for a battery-driven grass mower, and way lighter than a gas-driven weed eater. The shaft height of LST136W is adjustable, enabling you to set the height to your desired and comfortable level, saving your arms and back from unnecessary strain. The trimmer’s head rotates, enabling you to change this mower into an edger. The best feature, this weed eater comes with a built-in guide that helps to keep your edging on the right path, and it flips out when you are trimming. The dual ability saves you time since it eliminates the need for different tools. This electric weed eater uses a 40 volts lithium-ion battery. The battery is extremely light and it only needs one hour to recharge completely, which is fast recharge time. The best thing, you can interchange this battery with other 40 volts Max tools such as the lawn mower, vacuum, and sweeper. An even better, you can rotate out the drained battery with a charged one from these tools if you want to do more trimming. You can increase or reduce the trimming speed of this weed eater using a dial. This is a superb feature since it conserves the energy when you don’t require the full-speed application. Difficult to maneuver the curved shaft. The ST80L210 is a high-quality weed eater that is powered by a battery and comes with whistles and bells. Available at a great price, this tool is the ideal solution for people looking to mow their garden to remove tough vegetation and weeds. The product is designed with a durable 80 volts, 2 amps lithium-ion battery that drives the 14/16 inches cut string. With the ability to provide a continuous 45 minutes of operation, this trimmer can clean an entire lawn with much power like that of the 32cc gas engine. One thing you will love about this product is that it has an extra battery and a charger that enables you to recharge the batteries when they get drained. This best seller is easy to assemble and is very light, making it ideal for both old and young users. One unique quality about this weed eater is that it is compatible with the majority of gas trimmer tools. This ability enables you to incorporated more powerful parts to this trimmer to make it even better when trimming tough grasslands. If you like the raw power of 2 strokes trimmers but dislike the hassle of mixing fuel and oil then this product might be what you need. The 4 strokes 25cc engine produces enough power to keep you happy, giving you 7000 rpm at the highest speed. After feeling the power that Husqvarna has, you will fall in love with it and never miss the 2 strokes model. The product features an easy-to-use air purge that eliminates the air in the fuel system and carburetor so that it is simple to start. This will be one of the simples pull you will ever experience. Its loop handle is carefully positioned to ensure that the weight is well-distributed for long-term comfortable use; which is what you need from a commercial weed eater. 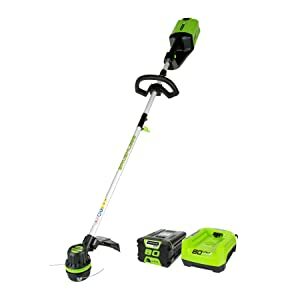 This trimmer has a heavy-duty twin line mowing system with Tap’n Go which makes it easy and quick to get the line working. You will surely love the fact that it has superb fuel efficiency and emits fewer emissions than a 2 strokes model. The engine can be run using gas. Works with all sizes of string. Smart startup tech for the engine. At 26.9cc, the TCG27EBSP is a powerful and durable commercial weed eater for the money. Tanaka is one of the brands within the Hitachi Power Tool Company, so you might get an idea of what type of trimmer it is. Every part of this product is built to last longer and be effective. The element that really sets this trimmer apart is the aluminum clutch cover which was designed for optimum reliability. The unit also comes with a splined firm steel shaft that is made to offer maximum comfort while reducing vibration. Changing trimming attachments is very easy because of the built-in bar lock. The trimmer doesn’t come with a harness but the rear and front padded handles are well-positioned for long-term and comfortable use. While some trimmers can be hard to start, the S-Start tech makes this product very easy to get cutting. The product comes with a two years commercial use warranty that is provided at purchase. If you want a commercial trimmer with durability, powerful performance, and fast throttle response, then this product might be your best bet. 2-cycle engine for optimum weed clearing. Offers maximum comfort when using. This brushcutter can clean dense bushes within a short time. One of its main features is the removable engine. This engine can power 10 other trimmers plus other attachments such as pole saw and edger. This 22cc 2 cycles full crack engine produces little vibration and offers longevity. It is also a breeze to start it using the JumpStart tech that enables you to start the motor without touching a cord. You can even use the SpringAssist which makes pulling it string simpler. 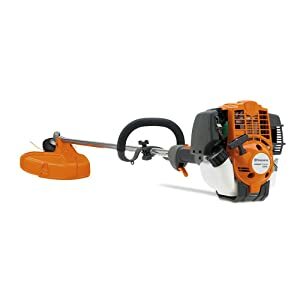 The trimmer has a straight shaft which is ideal for under bushes and shrubs. The other great feature of this weed eater is the high strength 4 tips steel blade that clears thick bush. However, one major thing that you should note about this product is that it weighs 14 pounds, which is a bit heavier than other brands. Luckily the trimmer has a shoulder strap that makes it easier to carry around. The unit will cut through dense weeds with little hassle. Comes with a powerful engine. JumpStart tech eliminates the need for pulling anything. At 14 pounds, it a bit heavy. 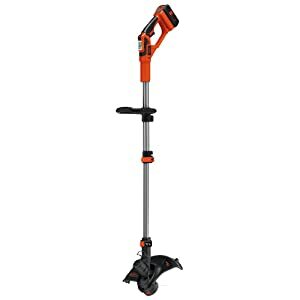 Although all the five models that we have reviewed above are all top quality products, we would pick BLACK+DECKER LST136W 40V Max Lithium String Trimmer as our number one choice. The product offers you more hours of use, can trim edges, and is easy to use. There are different types of weed trimmers. There are battery-powered weed trimmers, gas-powered weed eaters, and electric weed trimmers. They all do the same job of trimming your lawn but they differ in many areas. Plug-in weed trimmers or electric weed trimmers do not require gas or a battery to operate. These types of trimmers are easy to use since they only require a socket to power the engine. However, their use is limited to certain places; areas with electric source and up to the point where their cords reach. They are ideal for small lawn and yards because of the above shortcoming. They are also smaller when you compare them to other types of trimmers. They also produce less power than the gas-powered models. Battery-powered trimmers are noiseless and light. They are effective in clearing weeds in large gardens since they are extremely portable. They are also perfect during the time of power shortage or outage. However, you need to have an extra battery just in case the battery gets drained. These types of weed trimmers are more powerful than the other two types. There are some models of gas-powered weed trimmers that require pure oil to work while others require oil and gas. They are perfect for areas that are far from home since they don’t require a cord to operate. But although you can carry them around, their main con is that they are a bit heavier than the other 2 types. These are the most common weed trimmers used by professionals to do the commercial trimming. They basically feature cutting heads that are installed on long shafts and are driven by electric or gas engines. They are designed specifically for the commercial purpose and their engines are mounted on a backpack-like pocket. Their heads are installed on long shafts that are quite similar to the shafts of ordinary weed eaters. Their major benefit is that they don’t make you tired since you transport the main part of the trimmer on your shoulders. These are the most powerful trimmers out there. They are similar to the push mowers and come with wheels. They cut pretty effectively and are stable on most terrains but are hard and heavy to transport. Weed eaters usually come in two forms of shafts. Some come with a curved shaft while other comes with a straight one. They all serve the purpose of effectively cutting down tall grasses and weeds, but they differ in their level of comfort when it comes to handling them. These models usually boast of firm steel handles. When compared to curved models, these models are a bit heavier but they are recommended for users with back pain because they are longer. This will allow you to avoid extreme bending while using your trimmer. Furthermore, these models are perfect for reaching sides and edges of your lawn and garden dues to their length. The straight shaft also last-longer than the curved models. 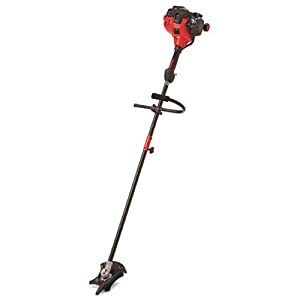 Curved shaft models of weed trimmers also provide a comfortable fit to most users. They are lighter than the straight models but a bit shorter. This makes them the best for maneuvering in tight corners and other areas. However, they are not perfect for users with back pain because they will need to bend to use the trimmer. They also don’t last long as they aren’t flexible, which often lead to breakage. The ease of use and comfort should have a similar important as that of the type of weed eater and the engine when you are buying a commercial weed trimmer. Remember that you will use your weed eater for an extended period of time, to ensure that you get a product that is easy to maneuver and comfortable to carry. Weight – choose a lightweight trimmer that has sufficient power and the right engine. Adjustable shaft – an adjustable shaft will enable you to manipulate the length of your trimmer to fit your need and also reach the most hard-to-reach areas with ease. Balance – a well-balanced weed-trimmer is easier to use regardless of the area you are using it in or the type of weeds or grass you are cutting. Anti-vibration systems – minimal vibrations will minimize fatigues, hence, this is a must-have feature in weed trimmers. Noise level – you will be using your trimmer for many hours, even a whole day, therefore, go for a model that produces the least noise. When selecting the best commercial weed trimmer for your needs, ensure that you choose a product that was made for heavy-duty use. The majority of manufacturers specify this in their tools; some don’t. 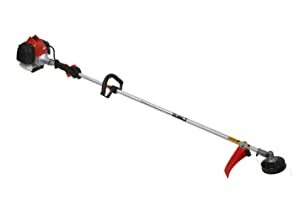 A weed trimmer that can easily change into other yard care tools might be more valuable to buy and comfortable to use. Although most of the commercial eaters are made for trimming purposes, some models accept additional attachments. Now take a look our review of the top commercial weed eaters on the market today. 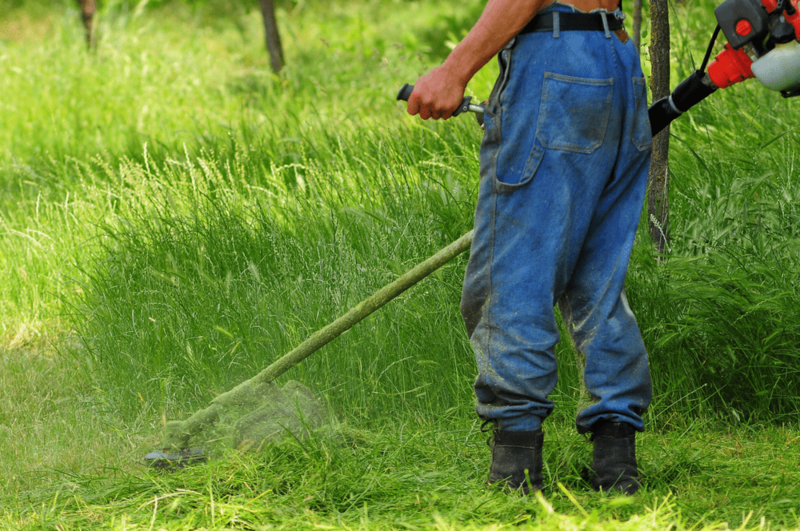 Always ensure that you put on a long trouser when running your weed eater to avoid getting injured from the weeds being thrown up as you work. We would also recommend you to wear ears and eyes protection. Remember that gas engines are quite loud and wearing ears protection will make your job to be more comfortable and even protect your ears. After you install a new string, hold your weed trimmer in the air before you engage the throttle. Ensure that you aren’t near the cutting head. The reason for this is to avoid being hit by the excess string that will be cut by the blade inside the guard. The string flies off at an extremely high speed. If you are trimming long weeds or grass, begin at the top. You shouldn’t cut more than 5 inches at a go. If you begin at the base where the weeds or grass is over 5 inches tall, you will place a lot of strain on the gearbox and engine. This might end up breaking your tool. Long weeds and grass might also wrap around the shaft as it moves, this might harm your weed trimmer. Work your way toward the ground until the bottom of your weed trimmer is just above the surface. You shouldn’t press the bottom of your machine to the surface. The only time you should do this is when releasing more string from the head. However, you need to remember that even during this time you only need to tap against the surface quickly. Also, remember not to do this regularly because you will end up wasting the string by releasing more than required. We would recommend you to lift the head up regularly to find out how much string is remaining and bump against the surface once and then check another time. You will have an idea of how much string you are wearing through. The string will wear out faster when cutting through weeds or grass with hard thick stems than when cutting regular grass. In addition, if the string hit fences, walls, and other surfaces, it might wear out faster and might even break. Therefore, ensure that you use a blade guard to avoid this from happening. Run your weed trimmer along the wall or fence with blade guard pressing against it (or any other object). This will prevent the string from coming into contact with thee surfaces. Just like all other products, you need to conduct a regular maintenance of your weed eater. You will find maintenance instructions on your user manual, although there are some things that you can do to make your trimmer last longer. For example, you should always remove the air filter and clean them before you begin the engine. You should also check the oil level and top it if need be, depending on the trimmer you have. It is very critical to do this. While you are working, regularly check that the shaft is clear. Sometimes there might be string, wire, or rope wounded around and this can impair your unit’s performance. This might also damage your weed eater in the long-run. Clean up all the buildup of weeds and grass cutting from your weed eater regularly. You should do this every time you complete a project, more regularly is better. 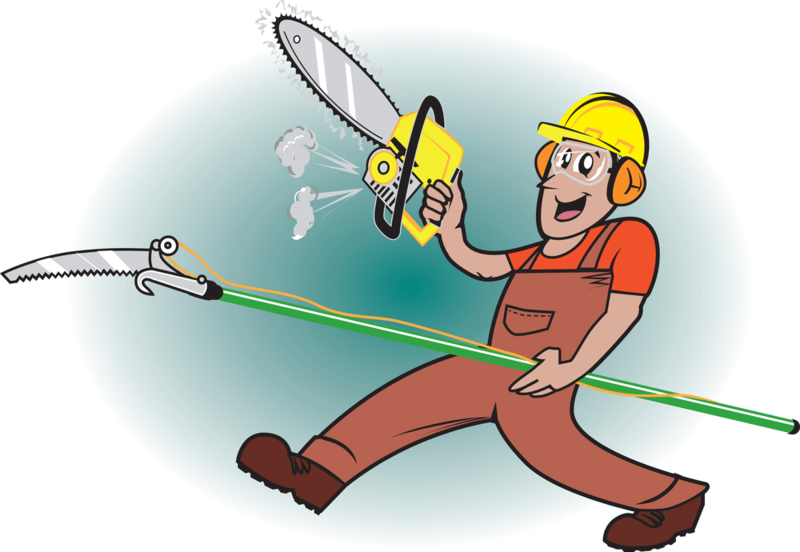 Q: Why does my commercial weed eater trimmer string break? A: These strings often break down to crowing. This happens when the head is held near hard objects that might break the string such as rocks, fence, cement, and brick. Keep the string fully extended, and don’t overcrowd it to reduce breakage. Q: What is the recommended Fuel-Oil mix ratio? The Fuel-Oil mix ratio for most weed eaters is set at 40:1. You can easily get this ratio when you mix 3.2 oz. of 2 cycle air engine oil with 1 gallon of gas. Over time, this oil will separate from the gas. Ensure that you shake the mixture thoroughly. What is the best commercial weed eater on the market? Answering this question is hard, but very simple if you follow our guide. Avoid buying one with the least price thinking that it will offer you value for your money. It won’t. Ensure that your commercial weed trimmer is durable, effective, noiseless, and easy to operate. Consider one of the weed eaters we have reviewed above and you won’t be disappointed. Choosing the best rubber garden hose can be a difficult and trying process that will test your patience. Garden hoses are used for different applications such as keeping your garden hydrated, cleaning your pathways, and even washing your car. Depending on your personal needs, you might need a specific kind of hose. The vast number of these hoses currently provided on the market has only made selecting the best one more complicated. These products come in a plethora of shapes, sizes, and color. Some are ideal for handling drinking water while others can make you sick. Some garden hoses are best for heavy-duty use while some are perfect for light watering. We have conducted an extensive research of the best rubber hose and created a buyer’s guide and a review list of the top rubber garden hoses to help you in your search for the perfect hose for your needs. This rubber hose is on top of our list due to the fact that it offers value for money. A bit heavier and might still kink, the Craftsman Premium Garden Hose is constructed of a highly durable material that makes it last for years. It is made of rubber medium radial which is quite durable and the two ends of the hose are reinforced by nickel plating which makes it a durable hose. With this hose, you can rest assured that you won’t get any problem with holes and leaks. Even if you leave it in the sun or drag it over hard stones, it will remain strong and last long. It is very easy to pull this hose around and across your house even if the water tap is at the rare of your house. The hose uses the latest concave hexagonal designed concave radial tire thread which is also reinforced to give you superb burst strength. You can use this hose to clean pathways even clear chewing gum from these ways. Perfect for cold and hot water. This hose comes in different diameters and lengths including 5/8-inch or ¾-inch diameters and 100 ft., 75 ft., or 50 ft. lengths. The garden hose is manufactured with reinforced mesh layers that guard it against any damage. Its couplings can hold 1,400-pound of pressure and are made of aluminum material. Although this hose isn’t recommended for hot water or drinking water, it still offers you great service while working in your garden. It is suitable for heavy use and will last for years. The other great feature of this hose is that it is very affordable; you don’t need to break a bank to buy it. Available in different lengths and diameters. Not perfect for hot water. The Apex Commercial All Rubber hose is perfect for both hot and cold water use. It is able to handle about 180 degrees of water heat without getting damaged or changing its shape. Its material is mainly made of rubber and it offers a leak-free and kink-free gardening experience. 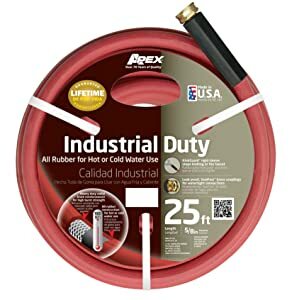 One great feature, Apex provides a lifetime warranty on this garden hose. This just shows you what you should expect from this hose – durability. The hose itself is 5/8-inch thick and 25 ft. long. The best thing, the entire package features a black hose collar and solid brass couplings. 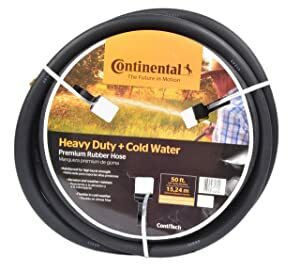 Continental ContiTech Black Garden Hose is a heavy-duty garden hose that is reinforced for better burst pressure of 350 psi. It comes with a heavy gauge (3.7mm) wall that is made of rubber, which happens to be corrosion and abrasion-free. It also features a heavy gauge rubber (1.8mm) tube for maintaining the desired pressure. This garden hose is fitted with 5/8-inch crush-proof brass cover for added strength and for resisting corrosion. It can handle a temperature of between -40 degrees to 160 degrees. This hose offers a burst strength pressure of 500 psi. This is one of the highest strength bursts on the market today. This often gives you the assurance that the hose will last longer and never break under high pressure. The other great feature of this hose is the couplings which are made of heavy metal to ensure that it is durable. The hose has a metal spring on the top that makes sure it doesn’t kink easily. One great feature that will make you love this garden hose it that it comes with a lifetime warranty, so you don’t need to worry about it leaking. Lastly, the hose extends to about 100 ft., which is sufficient to reach all the corners of your garden. 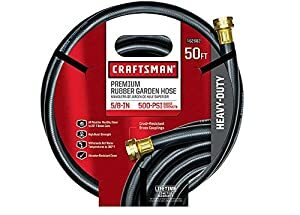 Right away, Craftsman Premium Rubber Garden Hose is surely a premium hose. Its rubber is heavy and sturdy in your hands, yet the hose is still flexible enough to navigate through your backyard with ease. Its premium feel makes a lot of sense given the material used to construct it. It uses a heavy rubber and is reinforced with nickel plating brass. There is no single garden hose that is perfect for every person. What works for me might not work for you. It will depend on the size of your garden, where you will store your hose, your budget, and how you intend to use your hose. With that said, there are at least six things that you should keep in mind when looking for a rubber garden hose. Always purchase the length that you require. Garden hoses often come in 100-, 75-, 50-, and 25-foot lengths. You might be tempted to get one-long-hose and use it for all your needs around your home. We don’t recommend that. A longer hose will cost you a fortune, be difficult to move around your garden, need more storage area, be difficult to drain when you want to store it, and might lead to low water pressure. Determine the furthest corner from your spigot and get a garden hose that will just reach that point. The most frequent hose diameters are ½-, 5/8-, and ¾-inch. These are the inside diameters of garden hoses, not the outside ones. You might know that water requires a bigger diameter in order to flow more. A garden hose width of 5/8-inch is often sufficient. It offers a superb combination of pressure and water flow without being heavy. If a rubber garden hose weight is your main issue, a 1/2 –inch hose might do wonders. They are light but don’t carry sufficient water. These hoses are best kept at most 50-foot and used for light work, such as watering hanging baskets and containers. Some types of rubber garden hoses are highly prone to break than others. Ensure that you get the one with the ideal burst pressure rating. If you intend to use a sprinkle or a hose nozzle, go for a hose with a high burst pressure of at least 350 psi. For high-pressure washer application, check the manufacturer manual before you buy one – you might require an extremely high psi. 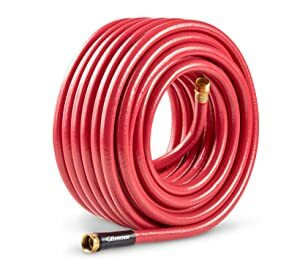 You should buy a garden hose that is flexible (for going around corners, easy storage, etc.) but not extremely flexible that it ends up kinking easily. Kinking will split your hose and even shorten its life. Although all garden hoses kink when twisted, some are slightly better than others. 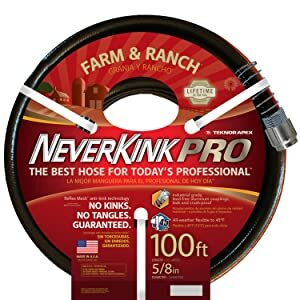 In general, a reinforced garden hose is less likely to kink when compared to unreinforced one. Couplings are the end parts that attach to nozzles, sprinklers, and spigots. Less expensive models usually come with plastic couplings. These are prone to breakages, cracks, and leaks and cannot be tightened well. Metal couplings, regularly brass (although is often chrome plated) are either cast or stamped. You can easily identify cast brass since it is slightly thicker than sheet metal and it features an octagonal shape so that you can turn to coupling into a wrench. Couplings constructed of cast brass are leak-resistant and the most durable. Quality garden hoses usually come with a rubber or plastic collar extending about 4-6-inch up the hose from the coupling. This minimizes the chance of split or kink near the connection, where they regularly occur. A garden hose has a short lifespan and you should be alert for any sign that might suggest failure, especially when you are working under high pressure. Your garden hose shouldn’t be subjected to any kind of abuse service. You should handle it with care. You shouldn’t drug your hose over abrasive or sharp surfaces unless it is designed for these services. You should take care to protect your hose from damaging end loads for which the garden hose or assembly wasn’t designed for. Always ensure that you use your hose at or below the rated pressure, any changes should be done slowly to avoid subjecting your hose to extreme surge pressure. Your hose shouldn’t be run over by any equipment or be kinked. When handling the large-sized and heavy hose, use a dolly whenever possible. A hydrostatic test and inspection should be done regularly to determine if your garden hose is still in good shape. In addition, conduct a visual inspection for loose covers, soft spots, and kinks which might be signs of displaced or broken reinforcement. The fittings and couplings should be examined and if you notice any movement, remove your garden hose from any service. This examination should feature a hydrostatic test for about 60 seconds at 150 percent of the rated working pressure of your garden hose. A rubber garden hose in your store can be affected by harsh humidity, temperature, oils, corrosive fumes and liquids, sunlight, radioactive elements, insects, and rodents. The right method of storing your hose should be determined by its size (length and diameter), the way you have packed it, and the quantity you want to store. You shouldn’t stack or pile your hose such that it creates distortions. If possible, always store your rubber garden hose in its original shipping container, especially if it’s a wooden one since it offers protection from corrosive liquids, oils, and other solvents. The perfect temperature for storing your garden hose ranges from 50 degrees to 70 degrees F. If below, it might become stiff. 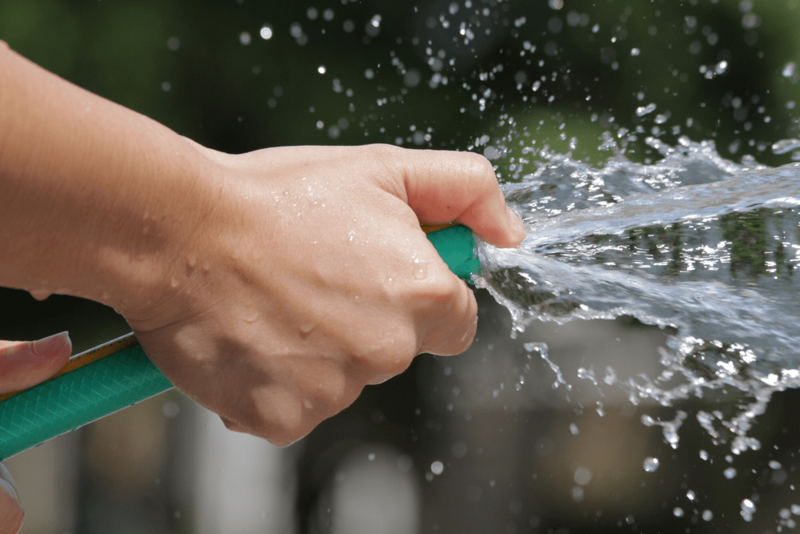 Q: How should I start to use my garden hose? A: There is no one way of starting to use a garden hose. However, you should always follow the instructions provided by the manufacturer to help extend the life of your garden hose. Q: What is the best way to store a rubber garden hose? A: When not using it, you should store your hose indoors to ensure that it last longer. Disconnect your hose from the spigot and ensure that you drain all the water. Coil your hose and then store it. Q: Are all garden hoses used for hot water applications? A: No. Only the recommended rubber hoses that you should use for hot water. They are usually labeled as 100 percent rubber. Q: Can I get a garden hose that I can use in cold weather? A: There are different hoses that you can use in the cold weather of about 40 degrees F.
We hope we have answered your question of, “What is the best rubber garden hose on the market today?” Always ensure that the hose you want to buy has all the major features of the perfect hose.